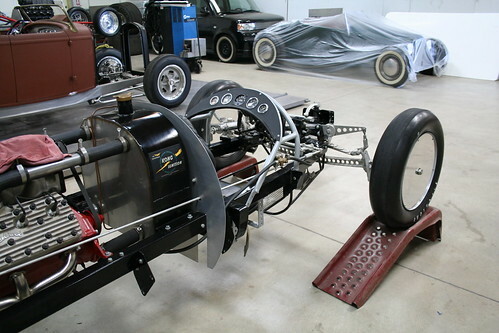 Home/Feature Cars/Race Cars/SoCal Belly Tanker Stripped Naked; We have the photos! SoCal Belly Tanker Stripped Naked; We have the photos! You have seen the photos, you have read the magazine articles, and you may have even seen the car in a museum or on TV but you have never seen it like this. 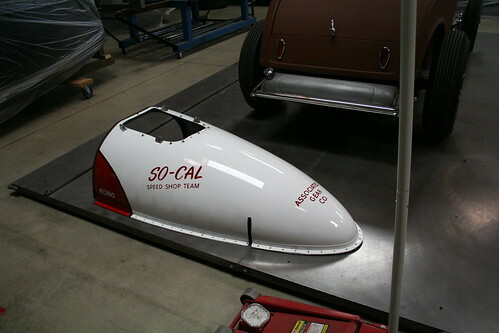 Alex Xydias and his So-Cal Speed Shop built the fastest unblown flathead-powered car in the history of Bonneville in 1951. It may be a slight exaggeration to call this land bullet a car; in fact it is as much airplane as car. Its body is a World War II 315 gallon belly tank from a surplus P-38. Lockheed had spent lots of time in the wind tunnel with these tanks making them aerodynamically “slippery” and they were available as war surplus for $5! It was August of 1948 when Alex installed a “souped-up” Vic Edelbrock Sr. built Ford 156 cu. in. V8-60. Alex took this special car to El Mirage dry lake in California and set a class record of 130.155. 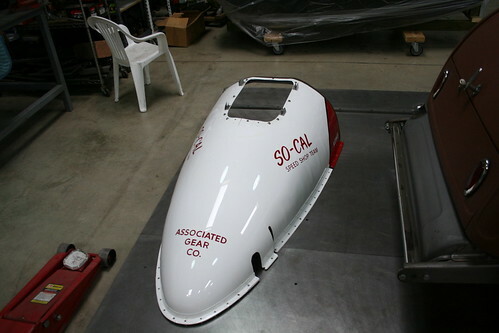 Initially the car was run as a streamliner, but the Southern California Timing Association (SCTA) created a special class for these fuel tank cars calling them “lakesters”. At the Bonneville Salt Flats the So-Cal Speed Shop team used the V8-60 to set a class record at 145.395. 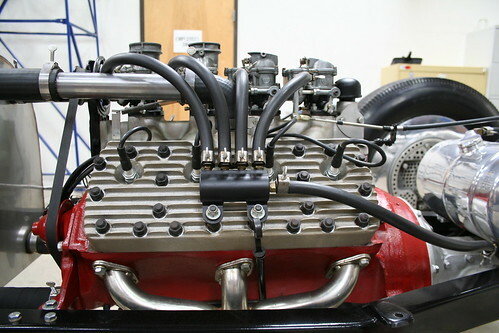 They swapped out the V8-60 for a larger 259 inch Mercury flathead and set another class record at 181.085. They then put in a 296 inch Mercury flathead and set yet another class record at 195.77 setting a one-way speed of 198.34 mph. This last class record was broken again the next day by Mal Hoopster running 197.88 in a Chrysler Hemi powered lakester in the same class, but the one-way speed still stands as the fastest speed ever achieved by a normally-aspirated flathead-powered car. 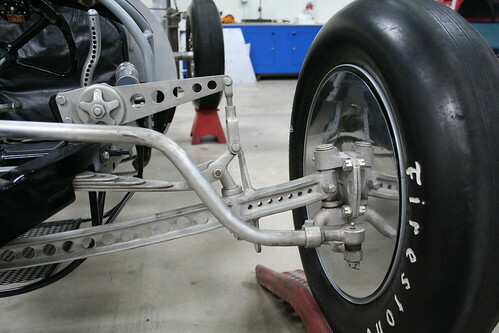 At the 1952 Bonneville Speedweek, this car was voted the “Most Honored Car in the History of Bonneville”. 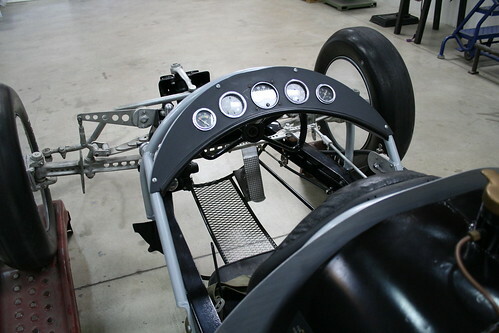 The front driver compartment skin. 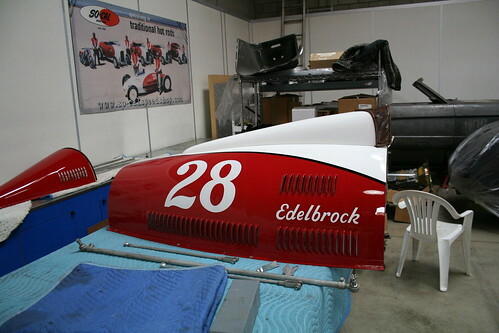 With the engine cowl and bubble canopy installed, the car with its red and white paint has become a So-Cal icon of speed. 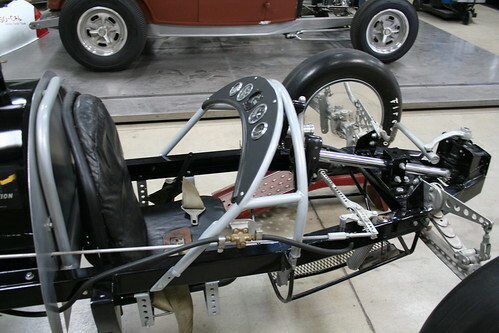 With the engine cowl and bubble canopy off the car appears almost simplistic and is much like looking at a human skeleton. 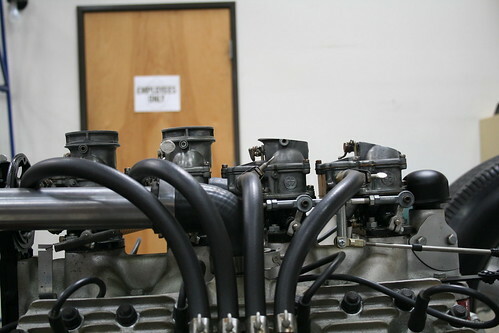 Look at the Stromberg 97 carburetors and note how they are modified to clear the streamlined tanker body. 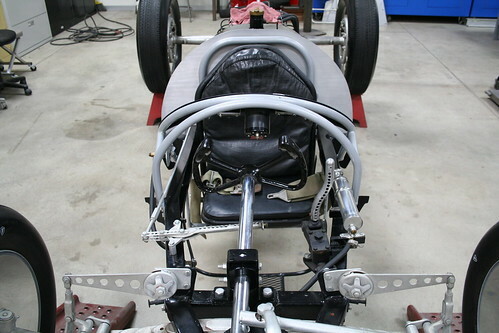 Look at how the rear two carbs are modified to fit under the body skin of the tank. Check out the driver’s seat and location. It appears like the driver (pilot?) is almost just hanging between the frame the rails. What must it be like to be doing close to 200 mph on the salt? Most of us will never know. This view of the Belly Tanker should give you a better understanding of the fearless drivers that take these monumental vehicles to record speeds. Want to sit here and drive this over the Bonneville Flats? Every thing that could be drilled, was drilled. 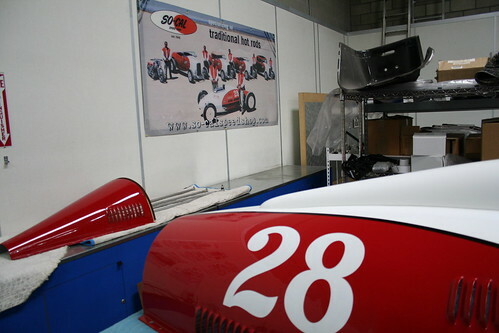 For more on So-Cal’s Speed Shop go to our On Tour Page. To read and see more on the So-Cal Special Click Here. These are some great pictures. 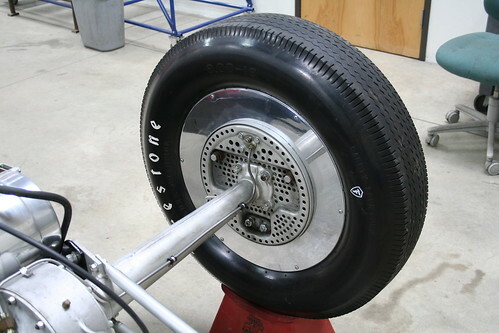 I wish I had seen them earlier when I started my Belly Tank car, then I wouldn`t have had to re invent the wheel every time I made something on my car. 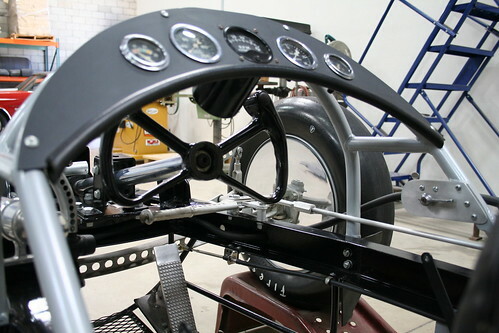 When I started my car (1994), the internet didn`t exist and it was almost impossible to find anything to build a car like this, so I made my own tank. 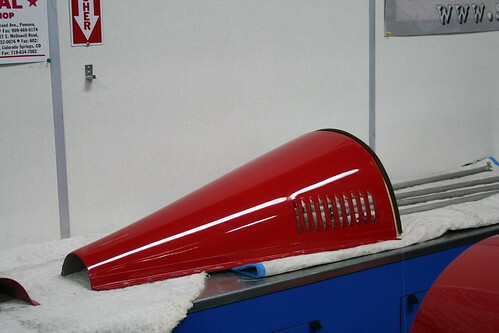 There are pictures on my website, http://www.mccainautomotive.com if you would like to see them. Hi there fantastic page with really great detailed pictures! 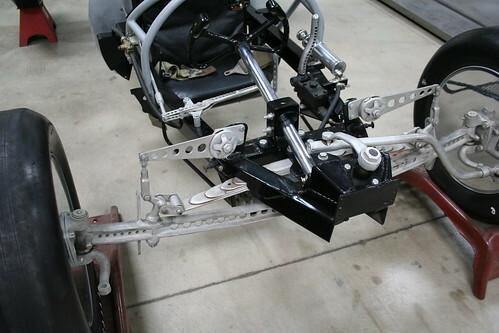 Im trying to figure out exactly how the front suspension set up works, could you shed some light on it?